or in this case also serving as breakfast as it's my first meal of the day. 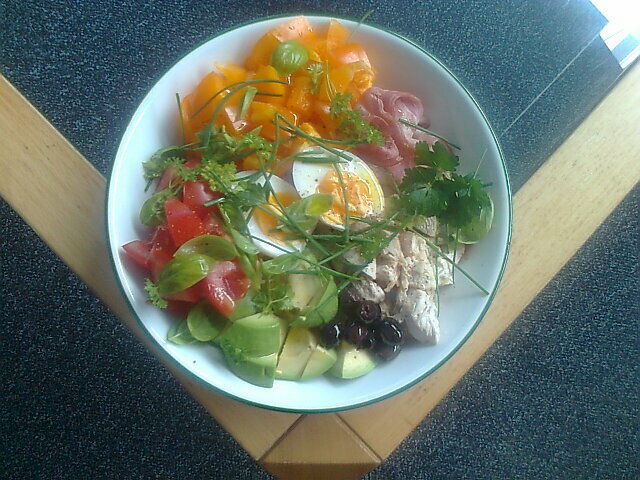 For those that like to know the details : cubed chicken breast/orange bell pepper/tomato/avocado half/boiled egg/bacon/taggia olives/fresh herbs: basil, chives, 2 kinds of parsley (curly/flat)/EVOO/freshly ground black pepper. Feel free to add yours. Pics are welcome. 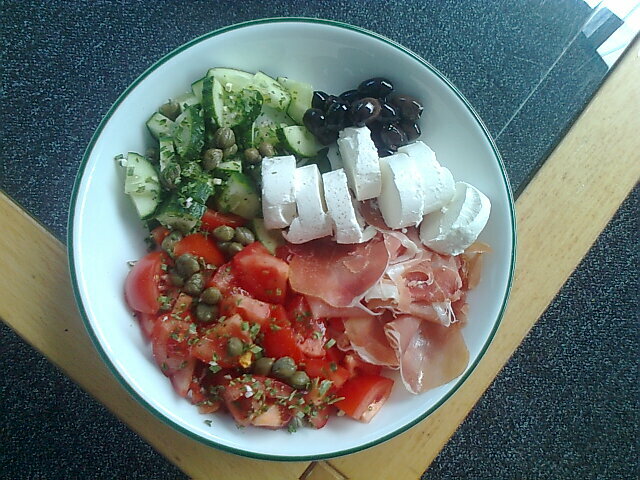 Tomato & cucumber with mixed salad herbs and capers, goat cheese (half of which ended up saved for another meal as it turned out to be too much for this one ), Serrano ham and taggia olives. And the boiled egg I ate while prepping counts too, I guess, even when not pictured. Those look like great lunches. The pics look like they're from a cookbook. ONTARIO wrote: Those look like great lunches. The pics look like they're from a cookbook. Thanks Ontario. Tasted good too. Yesterday's bowl of cubed chicken, bacon and pork tenderloin leftovers was not pic worthy, however was plenty to fill the belly til dinner too. Lunch here is the first meal as well, and is usually around 1-2 PM! Other days it's a BAS or rarely a fast right through dinner. Works for us! 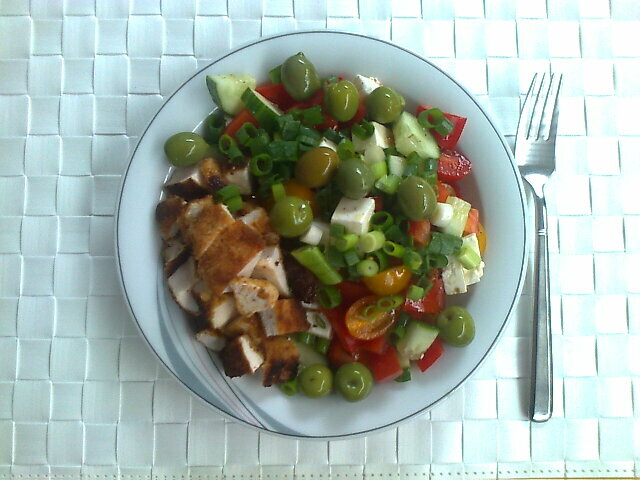 Greek salad (tomatoes/bell pepper/cucumber/feta/olives/spring onion/EVOO/lemon juice/oregano/s&p) & chicken breast. American plates vs European ones? It's a deep plate, not that it matters much. It was plenty for me though (second meal of the day). 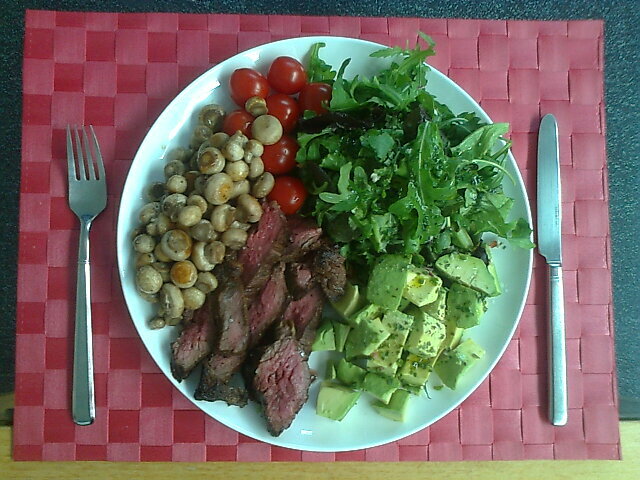 Enjoying my cup of espresso after a lunch of steak/baby button mushrooms/avocado/mesclun salad mix/cherry tomatoes/EVOO/lime juice/s&p/herbs. 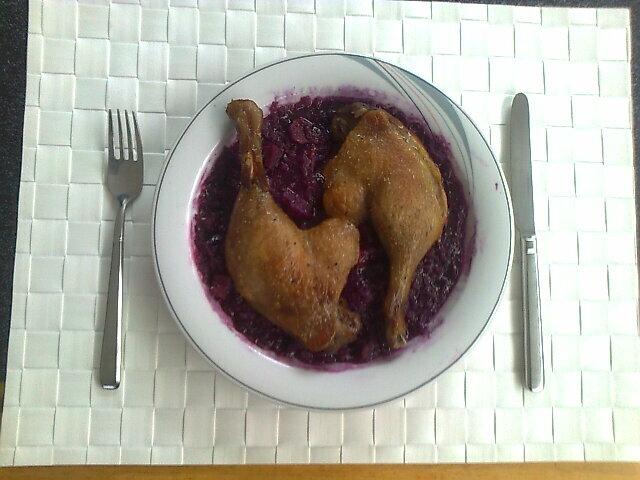 Oven braised duck legs on cooked red cabbage. 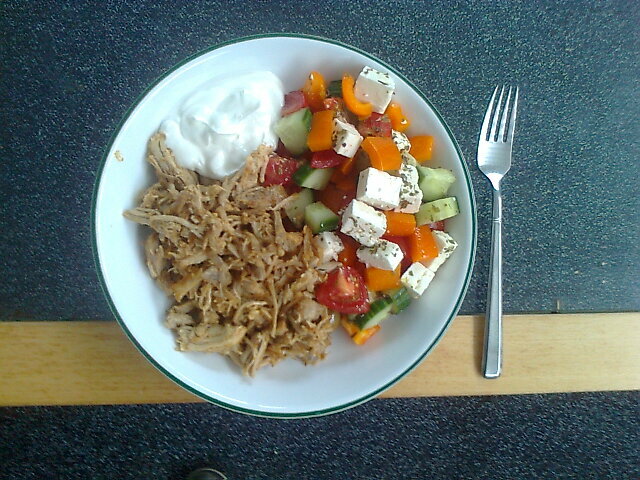 Pulled pork with hot sauce, yogurt, Greek salad. your plates look so pretty as well as yummy. Annieh wrote: your plates look so pretty as well as yummy. I always forget until I'm halfway through my meal! Imagine a dish similar to scrapple, soft on the inside, nice crisp exterior, served with some bacon... no apple/onion on the side... yeah, exactly, hence no picture. Lovebird wrote: Imagine a dish similar to scrapple, soft on the inside, nice crisp exterior, served with some bacon... no apple/onion on the side... yeah, exactly, hence no picture. They don't do a lot of scrapple here in North America. Most people will have no idea what that is. I know what it is but most won't. So I say, share you picture. Scrapple is big in the Pennsylvania area. It sounds very similar to what you are describing but it is traditionally made with cornmeal and with a different spice mix. I have been able to find gf versions, which are very tasty. Some have a stronger liver flavor than others. The meat in scrapple is ground fine but it is not smooth because of the cornmeal. Thanks V! Can't say there's a strong liver flavour to this... and have to admit I c/p'd the spice mix list from Wikipedia as I've never made it myself (nor have any plans on doing so), contrary to some of my ILs who gifted generously over the years.. which was yummy btw.